Selv om det har skjedd mye på ølfronten i Norge de siste ti årene, har det faktisk vært alternativet til de store litt lenger, i alle fall i Oslo og i Trondheim. I begge byene er det bryggeripuber som har holdt det gående i mange år. Da de ble etablert, var dette storveies, med tilgang til, riktignok ganske snille, engelske og amerikanske øltyper fra fat. Trondhjem Mikrobryggeri ligger sentralt i byen, et stenkast fra Stiftsgården midt i Munkegaten. Derfra går du gjennom en av de smale veitene og finner en ganske typisk innredet bryggeripub med mursten, messing og bryggeutstyr. Stedet ble åpnet i desember 1998, og tilbyr også mat i tillegg til sine egenproduserte øl. Her får man burgere, salat og småretter, men også mer solide middager, for eksempel bacalao, som jeg tror har stått på spisekartet siden de åpnet. Ølkartet har vært ganske stabilt i alle år. Amber, porter, bitter, steamer, IPA og pils. I tillegg en sesongøl som har variert fra en fyldigere juleøl til et svært lett sommerøl. Jeg har i grunnen ikke hatt noe å si på ølkvaliteten når jeg har vært på besøk, men det har manglet litt gnist. Sist jeg var innom mente den hyggelige bartenderen at bryggeren var kommet på bedre tanker – etter et studiebesøk på Great American Beer Festival kom han hjem og mente at alle øltypene hadde vært brygget med for lite humle. Det betyr at de faste øltypene også oppleves som friskere enn før, og at man kan få smakt mer spennede øl, sist jeg var innom hadde de en utmerket rug-IPA. Men ingen har lovet at alt skal være enkelt. En del av den rustikke stilen har i alle år vært en stor tavle som har gitt oversikt over ølsortene, hvilken styrke de har og hva det har kostet med glass i ulike størrelser fra en tyve centiliters smaksprøve opp til en toliters mugge for deling. Men så kom Trondheim kommune på besøk. I følge adressa.no kom kontrollører fra Eierskapsenheten i Trondheim kommune på årets første skjenkekontroll 10. januar i år. Kontrollen omfatter 17 punkter, og alt var i sin skjønneste orden – bortsett fra krittavlene som henger over baren. Nytt av året er ordningen med prikkbelastning, som blir ilagt bevillingshavere dersom de skjenker i strid med loven. Og å fremheve øl fremfor vin og brennevin er altså i strid med loven. Eierskapsenheten (litt av et navn!) tilbyr seg på sin side å hjelpe med å sette opp tavlene slik at de er korrekte i forhold til loven. Oppsisjonen i bystyret stiller seg uforstående til denne håndhevelsen av loven. Petter Nome i Bryggeriforeningen finner det helt meningsløst. Tavlen har fått en solid omgang med svampen. Og Trondhjem Mikrobryggeri? Tja. De har vel fått flere spaltemillimeter nå på nyåret enn på de første 14 årene. Og markedsføringsverdien av det er vel langt større enn av den famøse tavlen. Og det er litt lettere å drive harselas med bokstavtro byråkrater i valgkampen. One of the oldest brewpubs in Norway, Trondhjem Mikrobryggeri, can celebrate its 15 anniversary later this year. If you visit Trondheim, you’ll have to look it up on the map, even of it’s just a stone’s throw away from the main streets, tucked away at the end of a narrow alley. But even if the neighbours are old wooden houses, the brewpub is your usual brass, copper and brick ensemble. The beers have been on the boring side, with the usual list of porter, amber, IPA, pilsener etc, but a recent visit to the Great American Beer Festival has made the brewer realize that he has been too greedy when it comes to hopping. 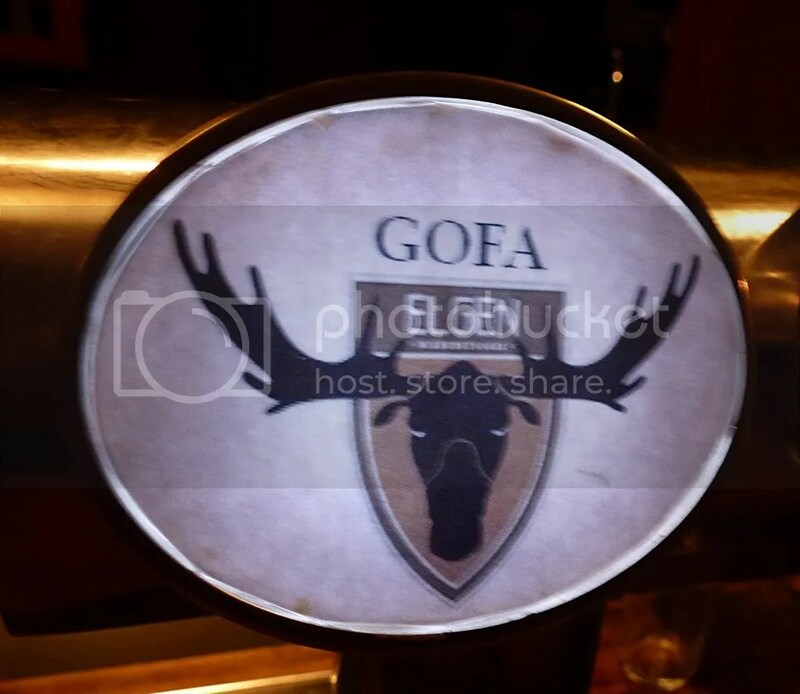 So, even if you have visited them before, it is worth checking out the new and fresher versions on tap now. 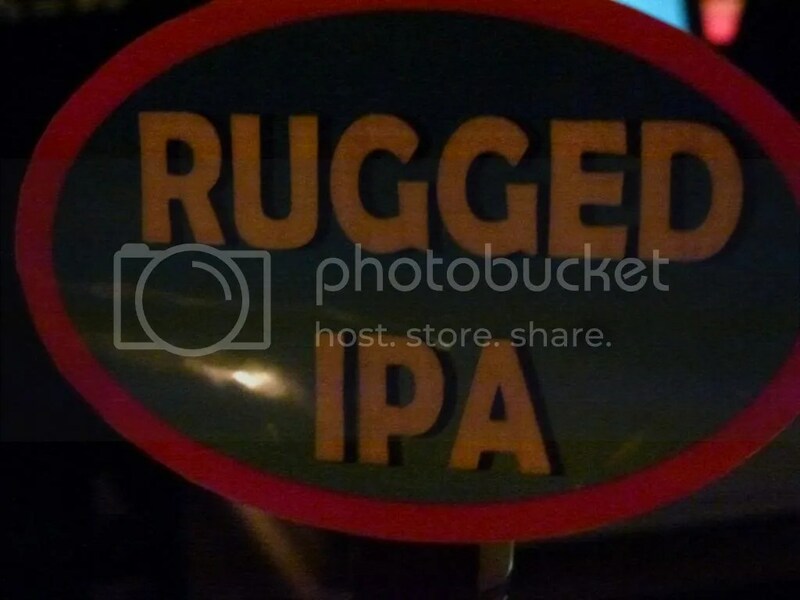 If you are lucky, there might also be special brews like the rye IPA I tried earlier this year. As mentioned, the interior is fairly typical international brewpub, including a large blackboard showing the beers on offer, including the prices from 20 cl samplers to 2 liter mugs for sharing. This blackboard has been there since the opening, but when the local alcohol licence authorities visited in January this year, they had objections. 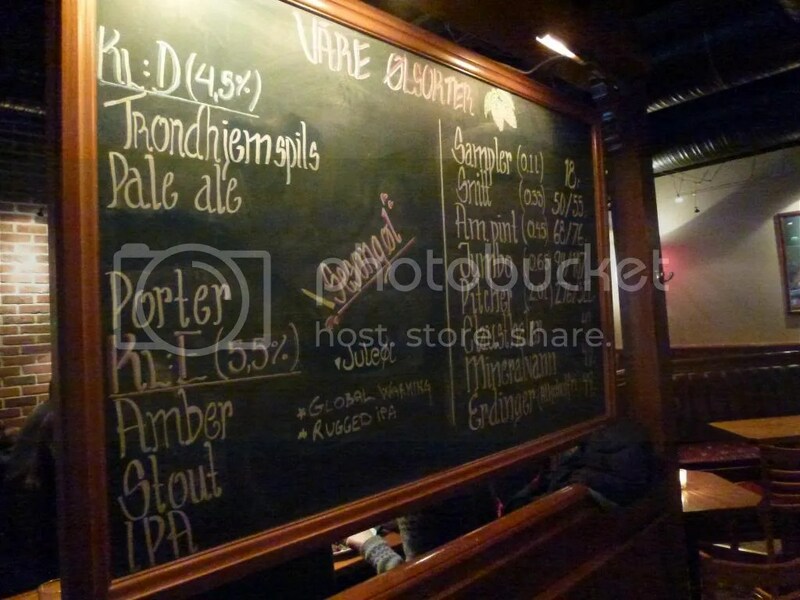 The blackboard showed the prices of beer and alcohol free alternatives without mentioning wine and stronger stuff. This means promoting beer, which is not allowed in Norway. As far as I know, the blackboard has now been wiped clean. But at least this has meant a lot of free publicity. And I have a strong feeling this case will be used fully in the months before our next general election. 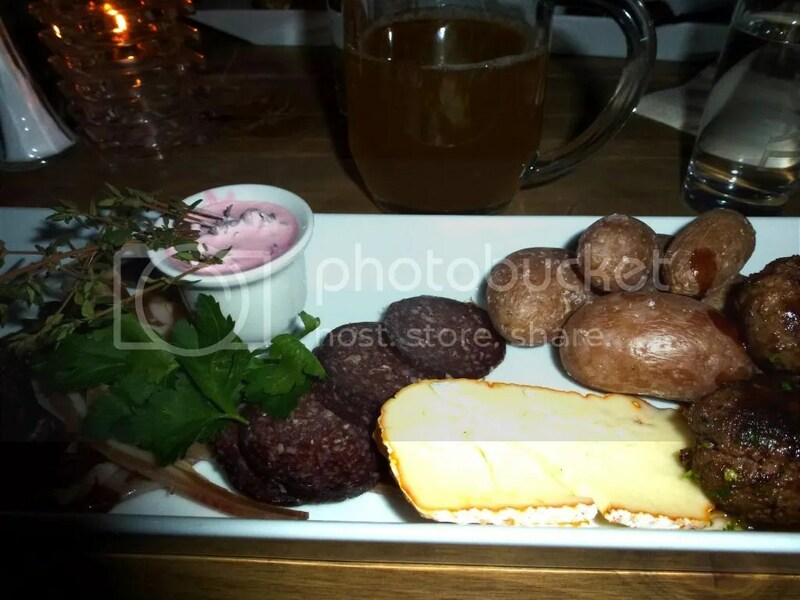 But, blackboard or not, do not miss Trondhjem Mikrobryggeri if you are in town. They serve food, too. They do burgers, but go for the bacalao instead. Time to burn off some bonus miles before Scandinavian Airlines disappear in a puff of smoke meant an opportunity to revisit Berlin, where there have been interesting developments. A hotel right off the Alexanderplatz was reasonably priced as well. And, as has become a habit, a mail order box of beers. 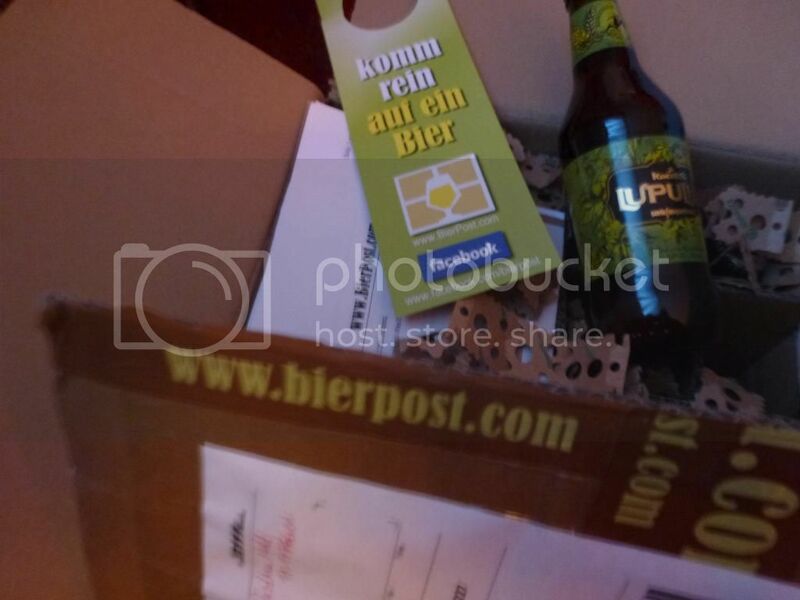 This time around from BierPost, a company located in Schwerin, where they also have a bricks and mortar shop. Some exciting new German beers defying the conventions, some traditional Bocks and Doppelbocks, and even a beer from Liechtenstein – more to feed the ticker than anything else. Sturdy packaging, the beers were just as ordered. Highly recommended. Decent rates for beer and postage, too. I particularly look forward to trying the beers from Schoppe Bräu and Crew Ale. There is even an ESB from Chile in there. Now to find the roll of bubble wrap. It used to be more easy. When I was young, everything was black or white. I won’t claim more wisdom now, but at least I have rubbed off some edges, most of them probably for the better. But my reflexes are more or less the same. I have no love for monopolies – public or private. This means I have never applauded the Nordic way of organising alcohol retail sales in governmental monopoly retail stores, either. But a recent briefing at the headquarters of Swedish Systembolaget made me think things through. Four of the Nordic countries have these governmental shops, Finland (Alko), Sweden (Systembolaget), Norway (Vinmonopolet) and Iceland (Vínbúðin). Finland and Norway allowed the sales of beer (and alcopops) below 4.75 % ABV in supermarkets, In Sweden and Iceland the limit is lower. This makes a significant difference: In Sweden, the bulk of pale lagers is sold in Systembolaget shops, in Norway, the bulk is sold in supermarkets. Things are slowly changing. There used to be monopolies of imports, wholesale and distilling, too, but they are history, largely do to European legislation. The retail stores used to be forbidding places with long lines outside the front doors and all bottles being hidden on shelves behind the counter. The strict Lutheran view of this being the devil’s dring hung like a dark cloud over the shops. There is one, frozen in time, at Norsk Folkemuseum in Oslo if you want to have a look. The public health concerns are the same as they used to be, but the drinking habits have changed. 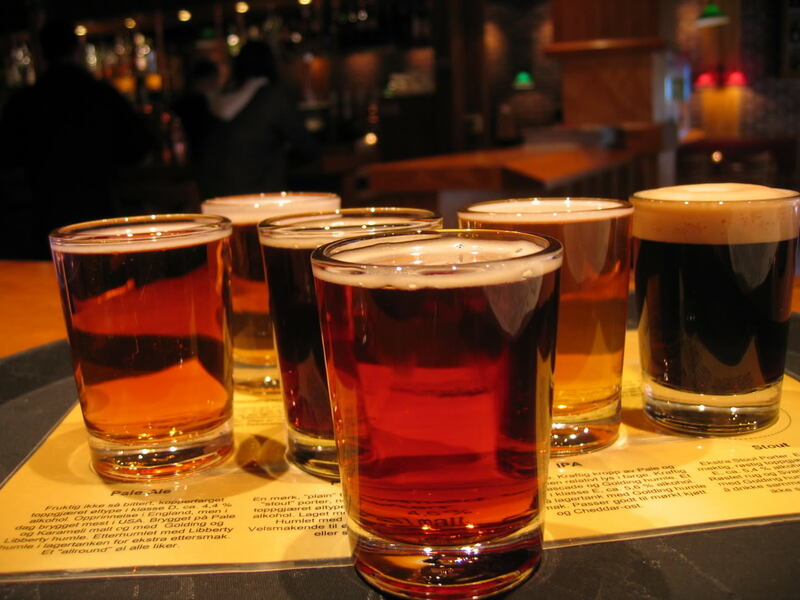 We drink less hard liquor and more wine, the pale lagers are stagnating while craft beer has an impressive growth. And the monopolies are adapting. Bright and cheerful stores with the full stock on display. Special release days for rare wine and beer. Apps for your smart phone. And while you won’t find any promotional material as such in a Systembolaget shop, the bottles, boxes, cans and wrappings for the six-packs do the job. In theory, you could argue that the Norwegian threshold of 4.75% means there is a better choice of everyday beers for the consumer. But that is not the case. We have four supermarket groups controlling 98% of the grocery market, and, while there are some shops who are now jumping on the beer bandwagon, the range available is limited to about one hundred beers in the very best shops. Three quarters of these will be pale lagers, for Christmas some of them will have som caramel coloring added. Sure, there are huge stacks of canned lagers in the Swedish shops, too, but the best of the shops have a large number of fine ales prominently displayed. And if you don’t find your favourites in your local shop, you can order them from the web site and have them in a week or so. Sure, you might argue, but what’s the option for those who live out in the sticks and don’t have a Systembolaget store in the neighbourhood? Simple, there is a large network of grocery stores who act as agents or ombud and where you can pick up your order. Like the post offices who pop up as shop within a shop nowadays. One major difference between Norway and Sweden is that the Swedish model is put under strong external pressure. As European Union citizens, the Swedes are free to bring home alcohol bought in other EU countries cor their own consumption. That means cheap booze from Denmark, Germany and Poland. Which means that Systembolaget have been forced to give a better shopping experience, better service – and to keep their prices down. Sur, they cannot underbid the prices of Polish vodka. But they can make sure that you can get a six-pack of lager for an affordable price without getting on a ferry. That means the price level in Sweden is often between thirty and seventy per cent of the prices in Norway for beer and wine. A decent can or bottle of BrewDog beer will typically be ten Norwegian kroner at Systembolaget but close to thirty in a Norwegian supermarket. Going into how we end up with this difference is a blog post of its own. So. Accessibility and price are two factors which make the Swedes smile all the way to the shop and back. But it’s also a matter of quality. When we visited Systembolaget HQ, we were attending a simulation on how they conduct their product testing. Their buyers try to follow the trends in the beer world, to stock Swedish beers and imports, to try to have a sensible mix of beer types, price levels etc. The beers that sell well get to keep their place on the shelves, others are replaced. 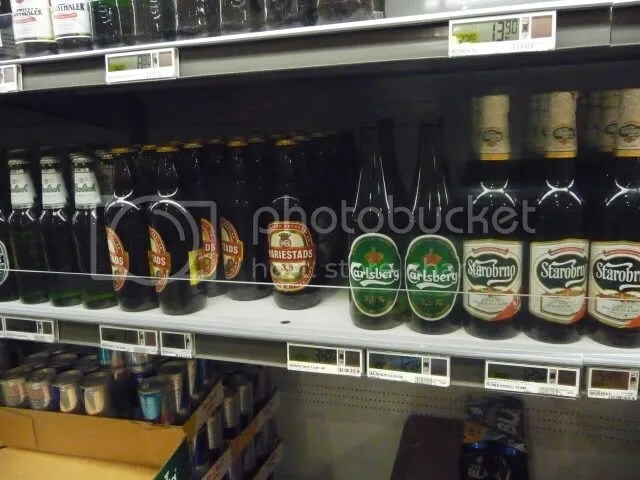 And there is a steady flow of calls for tender, stating the type of beer, possibly area of origin and stating something about the price level, say, 15-20 Swedish kroner for a half liter bottle. Depending on the product, importers and wholesalers then give a quote and send a certain number of samples. The labels will be checked, the price will be considered, and, for a number of beers, they will be tested blind. 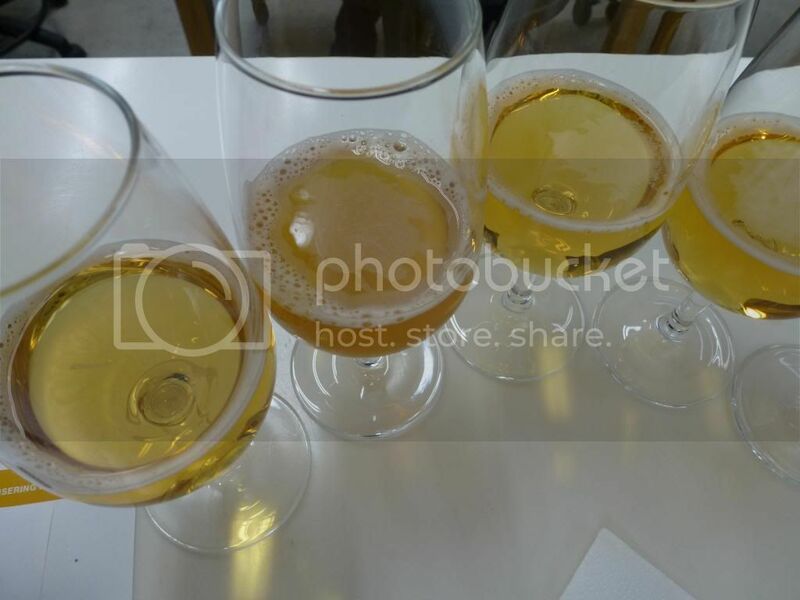 Our simulation was related to a call for German Kristallweisse, and, as two of the six samples were unfiltered, the test in not flavour alone, several senses come into play. The tastings take place in laboratory conditions, and the tasting teams spend a lot of time calibrating themselves, trying to avoid personal preferences and arriving at a common standard of quality that is appropriate for the beer in question. This is serious business. We are talking about the biggest retail chain in the world in this sector, if I’m not completely mistaken. And while there might be various views from the suppliers on how the system might be tweaked to be better and more fair, there does not seem to ba any loud voices asking for major reforms. Sure, there are discussions on how to allow farms to sell their beer and wine, and small-scale brewers might want better access to shops in their area than the present system that guarantees them shelf space in the three shops closest to the brewery. Is there a conclusion to this? If you want to give the public good access to a splendid range of quality products at affordable prices, this makes sense. Sure, I love Ølbutikken, Johnny’s Off Licence and all the other speciality shops across Europe. But that is for a tiny crowd of aficionados. And a quality system that avoids the worst of the crap makes sense, too. But I leave this open. I cannot praise a monopoly. But almost…. BTW, the visit to Systembolaget was a part of the annual meeting of the Scandinavian Beer Writers Association. A great bunch. Hemsedal er både en destinasjon i seg selv og et greit sted å stoppe mellom Østlandet og Vestlandet. Temperaturen var godt nede på minus 20-tallet da vi kom på besøk. Ikke for å stå på ski, ikke for å ta en pause på vei til Bergen, men for å besøke en attraksjon som nok er unnslippet radaren for de fleste – Elgen Mikrobryggeri. Bryggeriet er plassert bak en glassvegg i det som før var after ski-avdelingen, men nå er a la carte-restauranten i Skogstad Hotell. Dette er et overnattingssted med solide tradisjoner, etablert i 1905. Bryggeriet stammer ikke fra 1905 i følge Lars, som tok imot oss i resepsjonen. De har brygget øl til gjestene sine siden 2008, og det skjer i svært beskjeden skala. Hver batch er på 400-450 liter, og det brygges tre ganger i året. Det brygges bare en øltype, GOPA, som er et friskt hveteøl. Vi ble møtt med beklagelser om at ølet nok var i ferskeste laget, men det var ingen grunn til å være flau over dette brygget. Et hint av banan, frisk sitrus. Litt behagelig smak av gjær, men det bør det jo være i en skikkelig Weissbier. Den passet også godt til fatet med utsøkte lokale tapas, der spesielt kjøttbollene med kraftig viltsmak var fremragende. Det er litt sløseri å ha et anlegg stående og brygge bare et par ganger i året. Det hadde vært fint å supplere med en øl eller to til. En IPA og en Brown Ale, kanskje? Jeg foreslår at bryggeren tar en ukes tid og hospiterer hos Haandbryggeriet i Drammen. Det kan nok inspirere til å gå videre med prosjektet. Det er vel å ta i litt å anbefale at man drar til Hemsedal ens ærend for å smake på ølet. Men skal man feriere i området eller kjører igjennom, er det vel verdt å stikke innom for å ta et glass. 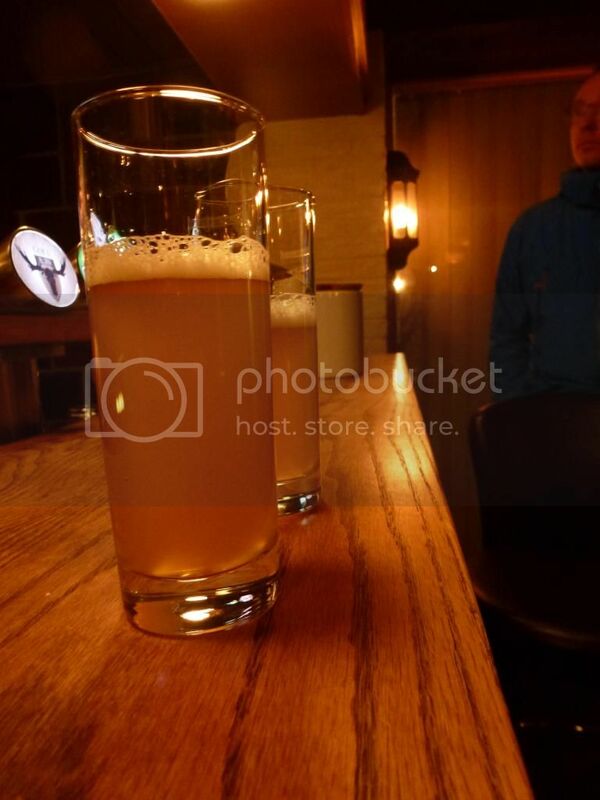 One of the smallest breweries in Norway is located in a hotel in the ski resort of Hemsedal. Elgen (The Moose) Mikrobryggeri has an annual output of three beacthes, each 400- 450 liters. The beer is a Weissbier, true to type with a nice citrus flavour.